Happy Thanksgiving! We have had a wonderful weekend and before I fully accept that tomorrow is Monday I'm going to post some pictures of what we've been up to lately. On November 14 we got to babysit Patrick's niece, Molly, while Molly's mom and grandma attended an afternoon tea at the Arboretum. We were pleasantly surprised at how easy it can be to feed a baby. This Thanksgiving was Charlotte's first since she began eating and we are very thankful for this. Her favorite dishes this year? Pumpkin pie and cranberries. The incredibly mild November weather has allowed us more time outside this fall than we had expected. Last weekend it was even warm enough that Charlotte rode her trike down our street. 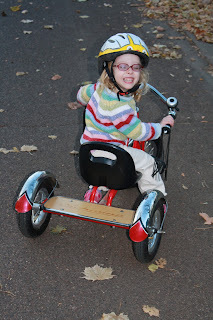 Patrick commented that this past spring her feet barely reached he pedals and now she rides with ease. She has taught (trained) us that when she rings her bell it means we need to run. Whether she wants to chase us, thinks we're too slow, or just enjoys having some power we're not sure. And now to the present - Thanksgiving Weekend! If you picked up the Star Tribune for the Black Friday ads (as I did) you may have noticed the cover story, Family Homecoming for Twins after 98 Days in 'Preemie Land'. Much of the article resonated with us, in particular the dad's statement, "People who don't have preemies probably never think about prematurity...and people who do never STOP." 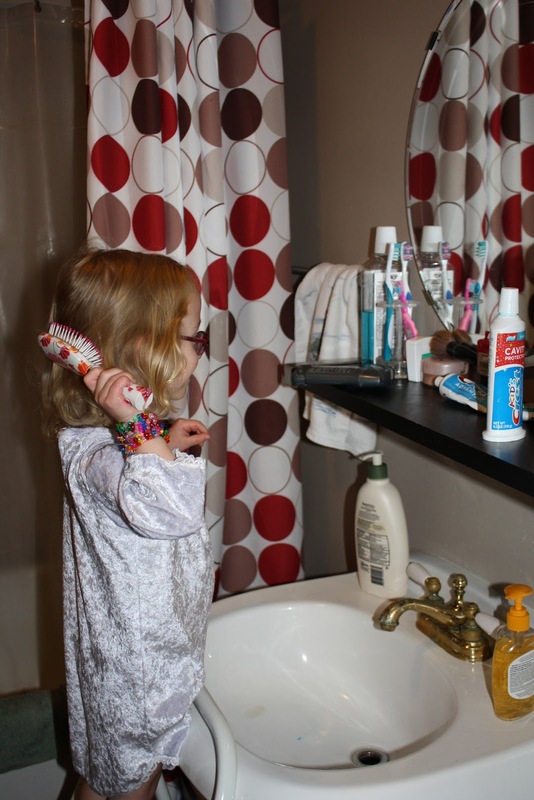 Even now that Charlotte is a happy, healthy 3-year old and the trips to the doctor are much fewer it is still something we think about frequently. Differently now though, as we are so grateful to have a 4-day weekend home with our active, happy toddler who breathes, eats, and poops on her own. This year we spent Thanksgiving with my family. Charlotte played hard all day, here she is dancing with some of her cousins (second, third?) to a dance video game. You may notice that the other three kids are following along to the game movements while Charlotte is rocking out in her own style. She fell asleep in the car on our way home at 5:15 p.m. and slept straight through until 8:20 a.m. Whew! What an exhausting day! Luckily we followed it by a relaxing morning at home before heading out to Aunt Kelly's house for a late lunch. It was great to see so much family this weekend. 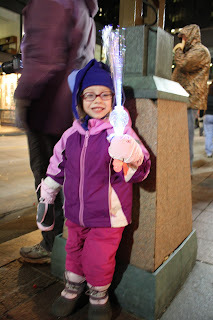 Friday night we decided to brave the burst of cold weather by taking in the Holidazzle Parade with Grandma and Grandpa Russell. Grandpa Russell surprised Charlotte with a special Holidazzle wand, and it turned out to be quite helpful in keeping Charlotte entertained while we waited for the parade to start. Below are a couple of pre-parade family photo ops. And with that, the Christmas holiday season has begun. 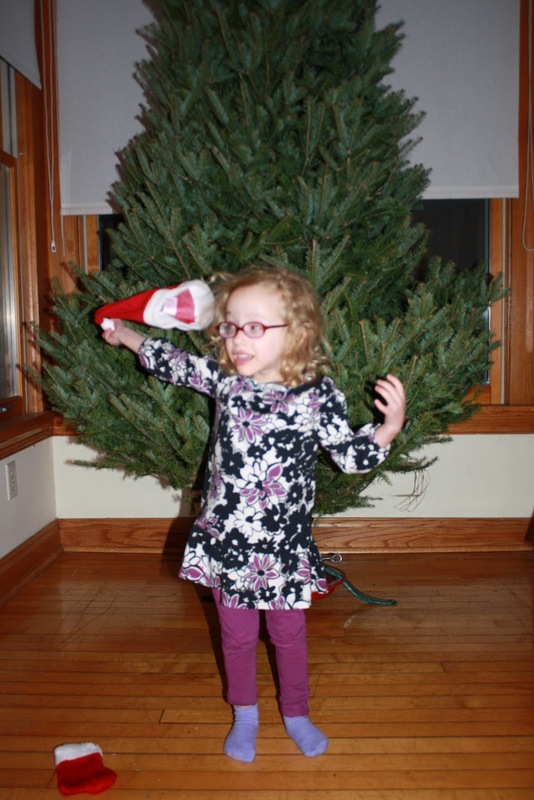 Saturday we picked out our tree and went with a slightly shorter tree than last year. Last year we learned that trees look smaller on the tree lot than they do in our house. 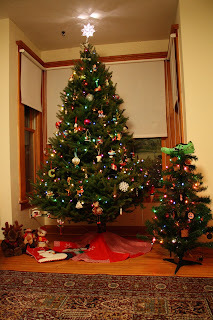 Our tree this year is still larger than what we were anticipating at 7.5 feet, but this time around we had no concerns about whether or not the star would fit on top. Here is what happens when I tell Charlotte I want to take a picture of her with her Santa hat - she quickly pulls it off to hold it up to the camera for me. I was so, so close to getting a picture with it on her head. 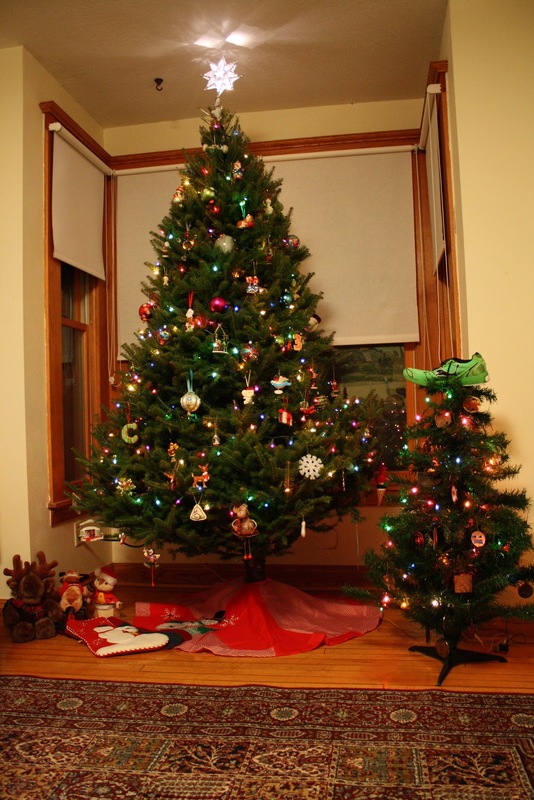 And what a great evening decorating the tree. Charlotte put on one ornament before it was time for her to head to bed and Patrick made a special trip to Menards after I broke our tree topper. Charlotte has needed a couple reminders today that we can look at the ornaments but that they need to stay on the tree. Thank goodness we have many stuffed musical creatures from Grandma Russell that she can play with. Happy Holidays! Fall is certainly here and we have been embracing the traditional fall activities. We carved pumpkins with our friends, the Behlings. Pictured above are Charlotte and Brodan in front of the window clings they hung and beside the pumpkins carved by the adults. Patrick and I carved the pumpkins to the right. Charlotte has been regularly asking to be held like a baby. Here she is snuggling with Patrick - too cute not to share! 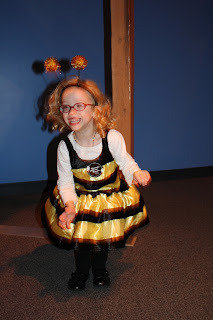 Our Halloween festivities began at the Children's Museum Halloween Party. 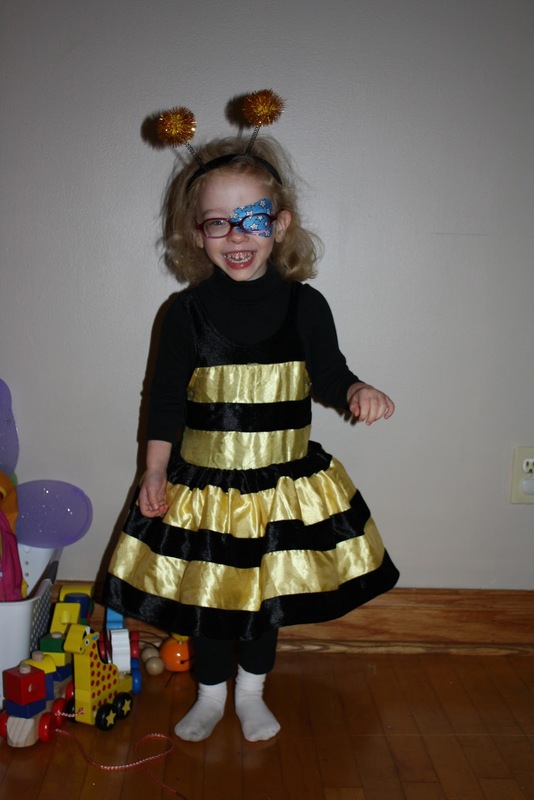 Charlotte went as a bumble bee and had a great time. She enjoyed all the usual museum activities made even more fun by being in costume plus fun treats and prizes throughout the museum. Bumblebee or turtle? Who's to say? This past weekend Charlotte and mom went to Aunt Kelly's for some halloween baking - spider webs and popcorn balls - and Charlotte got to help Aunt Kelly carve her pumpkin. "Help" is a generous description of Charlotte's contribution to this process - she lasted about the length of time it took to take this photo. She was a champ with the baking though - she diligently placed m&ms at the center of the spider webs. Charlotte played with baby Molly for a bit! And then danced the Chicken Dance with Grandma Russell! Once we got home Charlotte was anxious to try one of the spider webs. 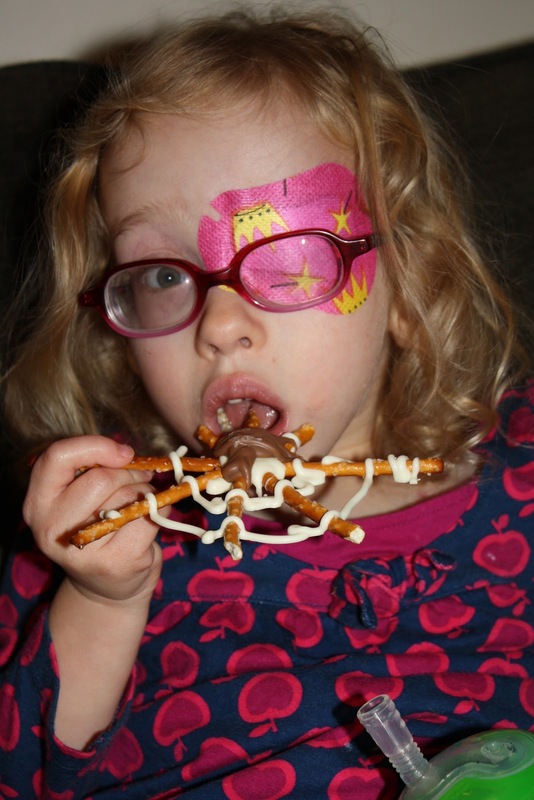 She definitely prefers salty to sweet - she ate all the pretzel and then left the middle part made of chocolate. Charlotte is now old enough to enjoy dressing up in costume and understand kind of what is going on. 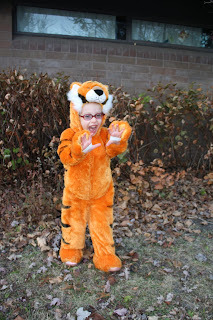 Here are a few photos from Halloween. 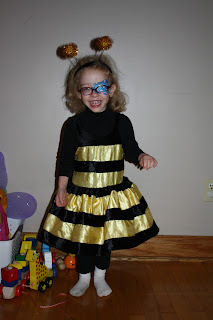 Charlotte donned her bumble bee costume once again for school. Here she is before we left home. 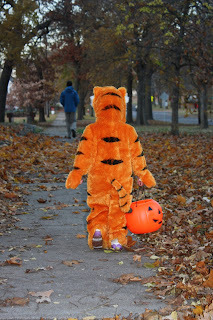 And here is our tiger trudging up to the playground for our neighborhood costume parade followed by trick or treating. 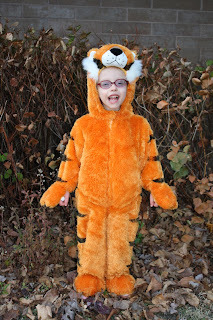 This was our first year trick-or-treating and Charlotte loved it. 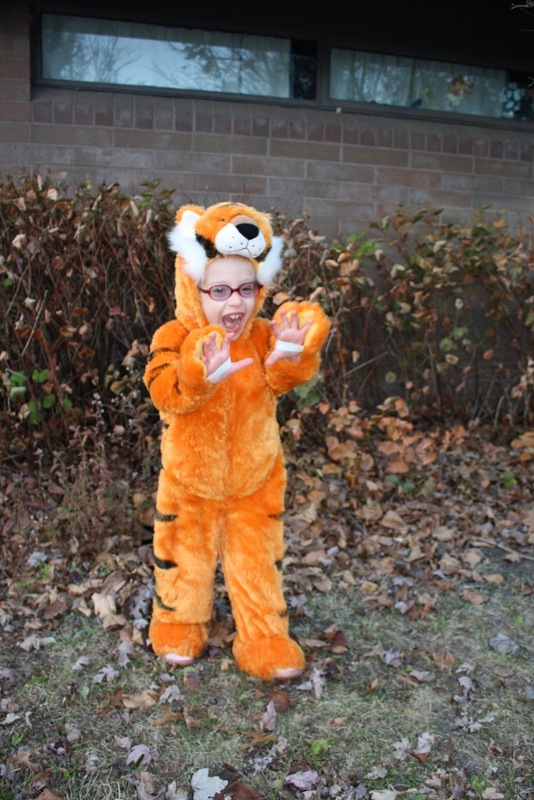 She was pretty excited to follow some of the older kids in our neighborhood around up to home doors and say "trick or treat" - luckily she tuckered out before filling up her bucket with candy. 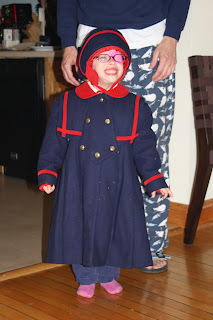 She was relieved when we finally left the group to head home and put on her PJs. Tonight she is cuddling with her tiger costume in bed. Charlotte's birthday weekend (last weekend) extended into 4 days of fun! On Saturday Katie and Charlotte went to a baby shower for Katie's cousin Marty and his wife Kelly. Here is a super cute picture of Charlotte with second/third cousins Faith and Beth. Charlotte has been giving her birthday balloons lots of hugs! Sunday was our 6th wedding anniversary and we had a great day. In the morning we cleaned (woo fun), then headed off to the Children's Museum for the afternoon (this photo is Charlotte very excited to be arriving at the museum), and the highlight was the evening when Grandma and Grandpa Russell babysat so we could go out for dinner and a movie. Thanks G&G Russell! More museum photos! Here's Charlotte with Curious George. She is so tight with this famous monkey that she refers to him as just George. Here I am passing on my golf skills. In keeping with 4 days of fun, Grandma and Grandpa Distad took Charlotte (and Katie) to the Minnesota Zoo on Monday. Pretty sure we took this picture last summer when we visited the zoo with Grandma and Grandpa Distad. It's a classic. Real, live dinosaurs! Well, ok, maybe not exactly but pretty close. Charlotte loved the Dinos and "roared" throughout the exhibit. Here she is with Grandpa in front of the Gigantosaurus (pretty sure I could have come up with that name). Here is Charlotte petting the baby T-Rex. "Well, if Daddy is allergic to dogs can we get a dinosaur?" And made friends with penguins. Hydration is important. Tip: make sure your water bottle is as big as you are. Tuesday we checked out the Minnesota Science Museum. It was fun! On Tuesday mornings they offer "Preschool Playdates" and admission is free with a Children's Museum Membership. Hopefully we'll get to take advantage of this perk again in a few months! Charlotte was near frantic running from exhibit to exhibit and she enjoyed the shows about making sound and monkeys. She soaks in everything and keeps reminding us that she does not have a tail, so she is not a monkey (we learned that Apes do not have tails and they are not monkeys). In other Charlotte quotes of late: "I have sand in my nose, there is sand in my nose!" - it was a booger.